We embarked on our Portland trip with a long list of recommended restaurants, and a good bit of our time there (and most of the money we spent) revolved around food — the norm for us. We needed plenty of good food to fuel our week of biking, walking, and hiking in and around Portland. We didn’t have time to hit everywhere on our list, so we prioritized eateries and food that we are less likely to find in StL, with a few home-cooked meals interspersed, to sate our love of cooking and save a bit of money. 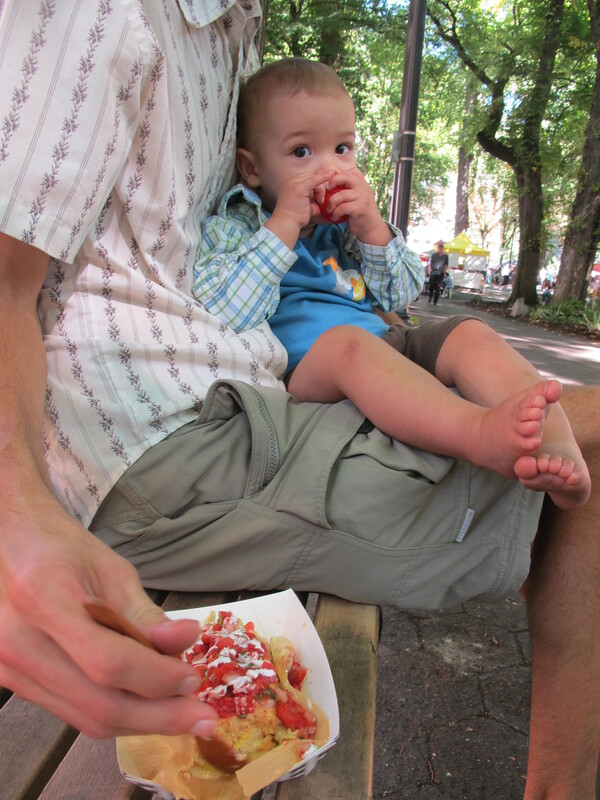 Our first meal out in Portland was lunch at a farmers’ market, where we enjoyed artichoke-goat cheese tamales. That evening, we had burritos at Cha Cha Cha — the Oregon Harvest burrito was our favorite. Despite being stuffed, the neighboring ice cream shop lured us in for a scoop of amazing browned butter almond brittle, which we shared as we walked home. Over the next few days, we enjoyed “The Oregon” pastry from Ken’s Artisan Bakery, house-made ramen noodles at Boke Bowl, ice cream at Ruby Jewel, and Ethiopian take-out from Queen of Sheba. 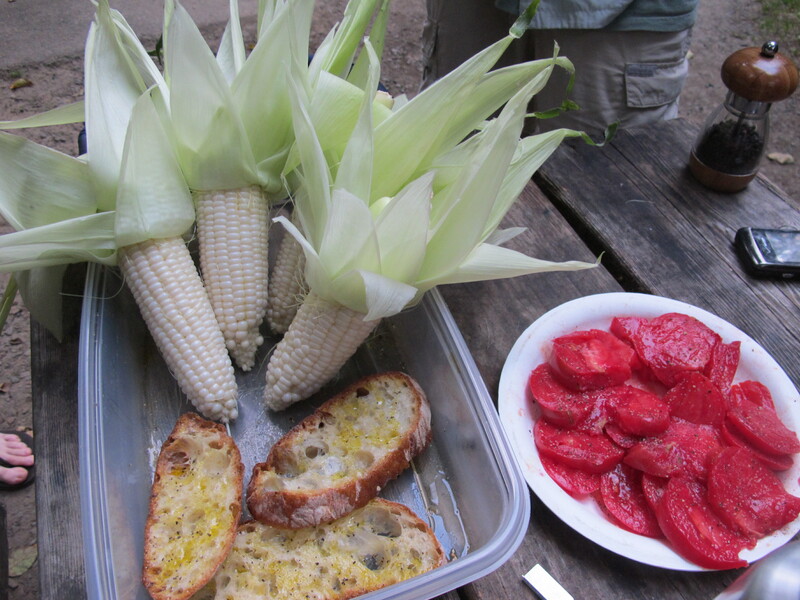 Over the weekend, we drove to the coast to camp in yurts and enjoy some grilled goodies. 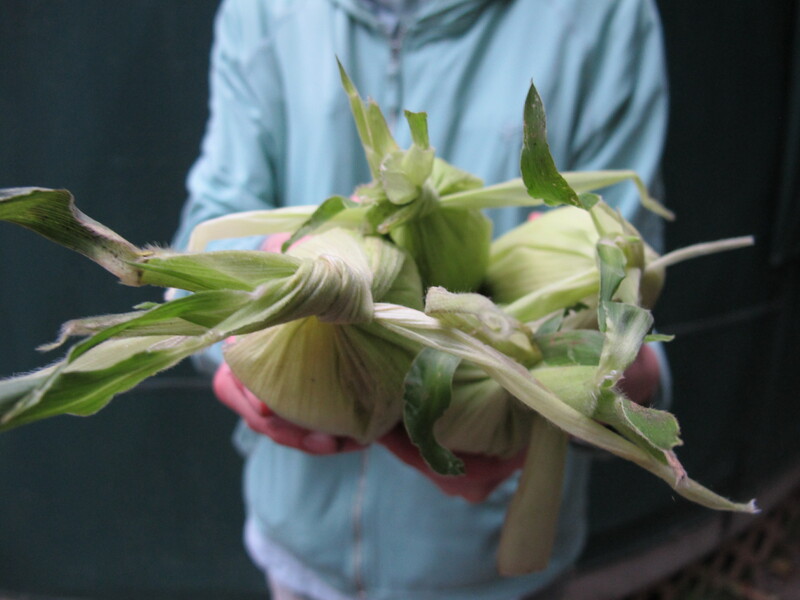 I took charge of the grilled corn project, with unexpectedly good results (stay tuned for tutorial post). The feast also included grilled bread with delicious Oregon tomatoes, grilled crackers with smoked Brie, veggie dogs, and baked beans. The only thing missing was hot chocolate (it was cold at the coast!). We remedied that with a stop at Cacao for some drinking chocolate, but not until Monday when we were back in Portland. Other than chocolate (and more pastries), our final days included not one, but two (very different) Thai meals, homemade injera stew (recipe later this week), and a vegan BBQ food truck. 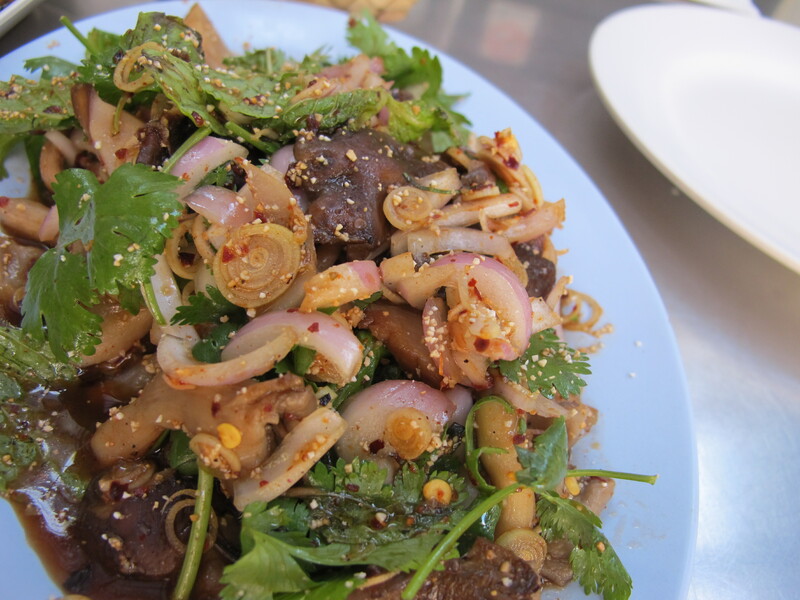 The [very] spicy mushroom salad at Pok Pok, which is known for authentic Thai street food. 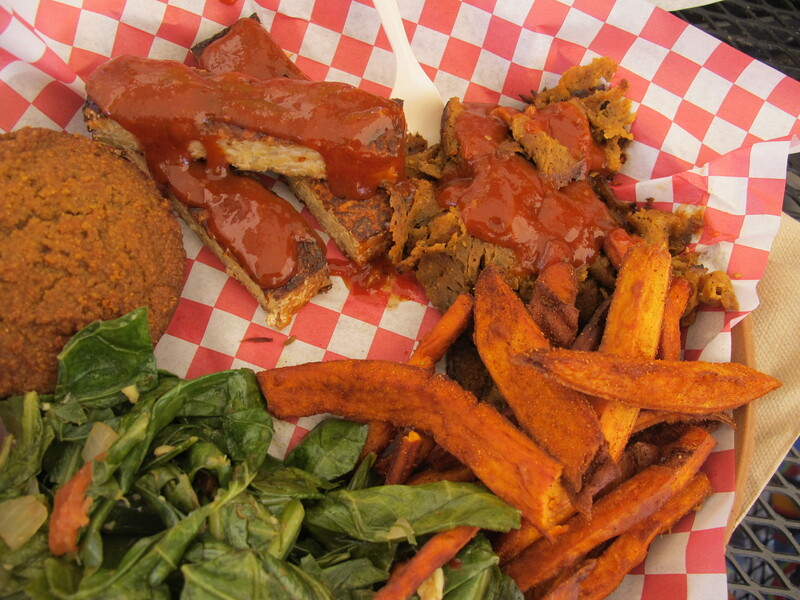 Our vegan BBQ meal included tempeh ribs, seitan pastrami, and some tasty sweet potato fries. 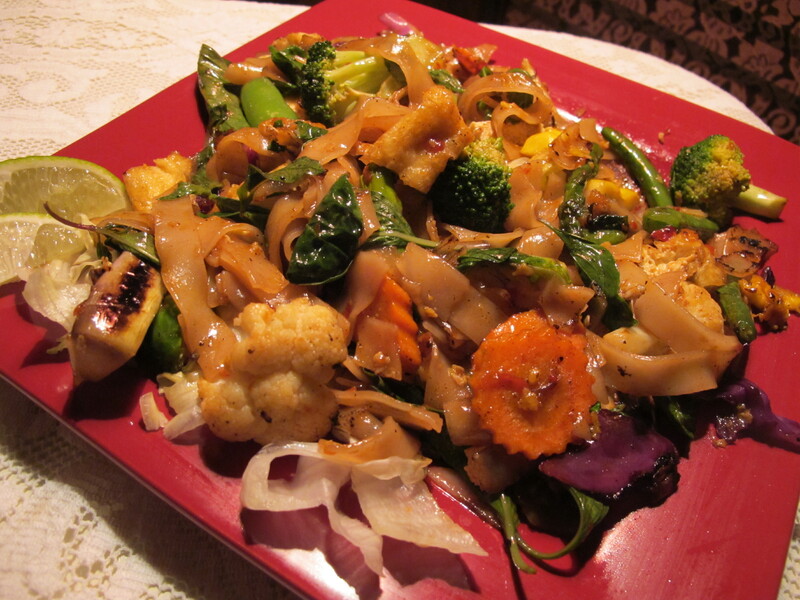 We capped off our visit with a date night at Kuhn Pic’s Bahn Thai. Tucked into an old Victorian house, Kuhn Pic’s is a labor of love for couple who run it (she cooks, he takes care of the front of the house). The restaurant puts the S-L-O-W in “slow food,” which is important to know ahead of time — have a good-sized late afternoon/early evening snack, plan on spending at least two hours there, and you’ll be ready to enjoy some beautiful and delicious Thai food. Our feast included the spring rolls, with the amazing peanut sauce for dipping, and two entries we shared — pad see ew and drunken noodles. We left tired and happy, my head filled with crazy ideas of attempting some kind of similar restaurant concept in StL. This entry was posted in Food and tagged Portland, restaurants. Bookmark the permalink. 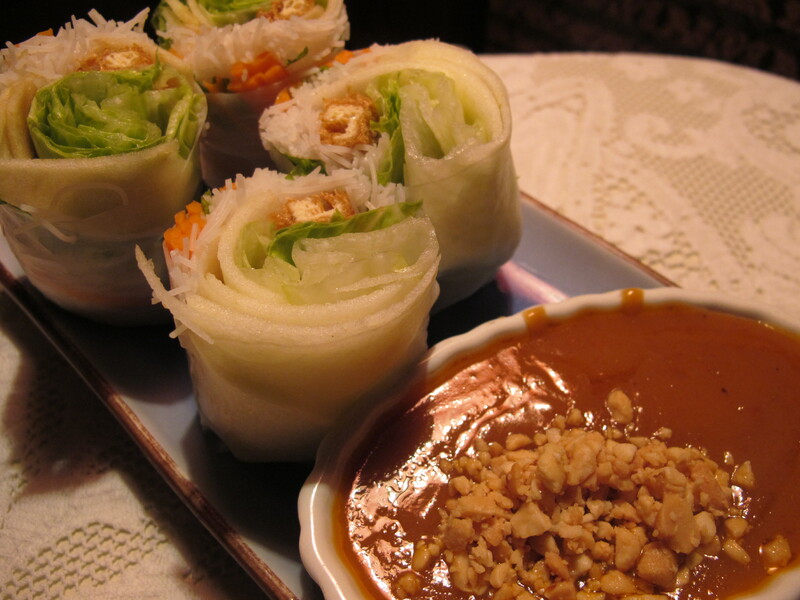 Kuhn Pic is easily the best Thai place in Portland, a categorical step above the rest. So glad you found it!!! Yes, we were fortunate to have my sister-in-law’s food recommendations.